Graduate Student. UConn, Social Psychology. Maryellen MacDonald, PhD., from University of Wisconsin - Madison will be discussing her work on language production and comprehension. 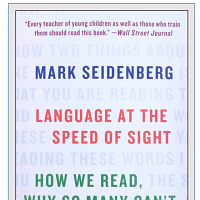 In Language at the Speed of Sight, internationally renowned cognitive scientist Mark Seidenberg reveals the underexplored science of reading, which spans cognitive science, neurobiology, and linguistics. As Seidenberg shows, the disconnect between science and education is a major factor in Americaâs chronic underachievement. How we teach reading places many children at risk of failure, discriminates against poorer kids, and discourages even those who could have become more successful readers. Children arenât taught basic print skills because educators cling to the disproved theory that good readers guess the words in texts, a strategy that encourages skimming instead of close reading. Interventions for children with reading disabilities are delayed because parents are mistakenly told their kids will catch up if they work harder. Learning to read is more difficult for children who speak a minority dialect in the home, but that is not reflected in classroom practices. By building on scienceâs insights, we can improve how our children read, and take real steps toward solving the inequality that illiteracy breeds. Both an expert look at our relationship with the written word and a rousing call to action, Language at the Speed of Sight is essential for parents, educators, policy makers, and all others who want to understand why so many fail to read, and how to change that. Mark Seidenberg is the Vilas Research Professor and Donald O. Hebb Professor in the department of psychology at the University of Wisconsin-Madison and a cognitive neuroscientist who has studied language, reading, and dyslexia for over three decades. He lives in Madison, Wisconsin. The University of Connecticut is a top-20 public university in the U.S. The Department of Psychological Sciences is routinely ranked in top 10 in U.S. grant funding and its doctoral program is ranked in top 30 public research universities by The National Research Council. Psychological sciences is one of the largest major at UConn with about 1,500 undergraduate students (1,100 at Storrs and 400 distributed across the regional campuses) at any given time. With so many students, the psychological sciences department is also one of the largest departments at UConn with over 50 faculty and a large team of administrative staff.